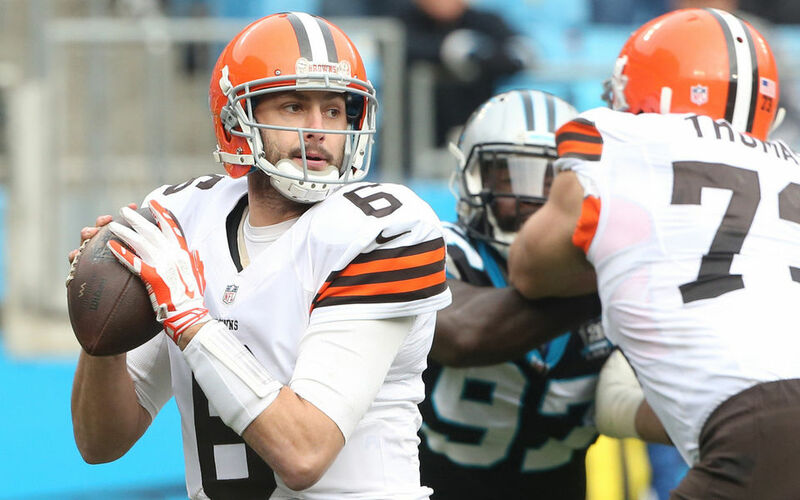 It was another typical December afternoon for the Cleveland Browns on Sunday in Charlotte. We just never thought we’d see it from this team. The Browns delivered an uninspired effort in losing the Carolina Panthers, the Browns 11th consecutive loss in the month of December. It’s been more than two years since the Browns won a game in the final month of the calendar year and, dating back to the 2010 season, are now 3-20 in the month of December. The short-term view of the loss means that the Browns, who were once 6-3 this season, can’t post a winning record this year – the best they can do is beat a Baltimore team that is fighting for a playoff spot next week to grab a .500 record. For a team that hasn’t won more than five games since 2007 that’s not an altogether bad outcome, but will still be disappointing based on where the Browns were just a few weeks ago. The long-term view shows that the Browns have plenty of problems, especially when it comes to the offense. Remember earlier in the season when the Browns were juggling three running and head coach Mike Pettine remarked that, “if you have three running backs, you don’t have any”? Well, the Browns thought they had remedied that situation by releasing Ben Tate, but it turns out that even if you have two running backs you may not have any. For some reason Terrance West did not play on Sunday, leaving the ground game in the hands of Isaiah Crowell, who continued his recent run of poor play. Crowell had 55 yards on Sunday in 16 carries. But 28 of those yards came on one rush, meaning Crowell averaged 1.9 yards on his other 15 carries. In his last four games, Crowell has rushed for just 2.87 yards per carry and scored just one touchdown. While Crowell and West are inarguably better than last year’s franchise-worst rushing attack, we’re almost a full season removed from that mess, meaning it’s probably time for Browns fans to accept that Crowell and West aren’t very good right now. 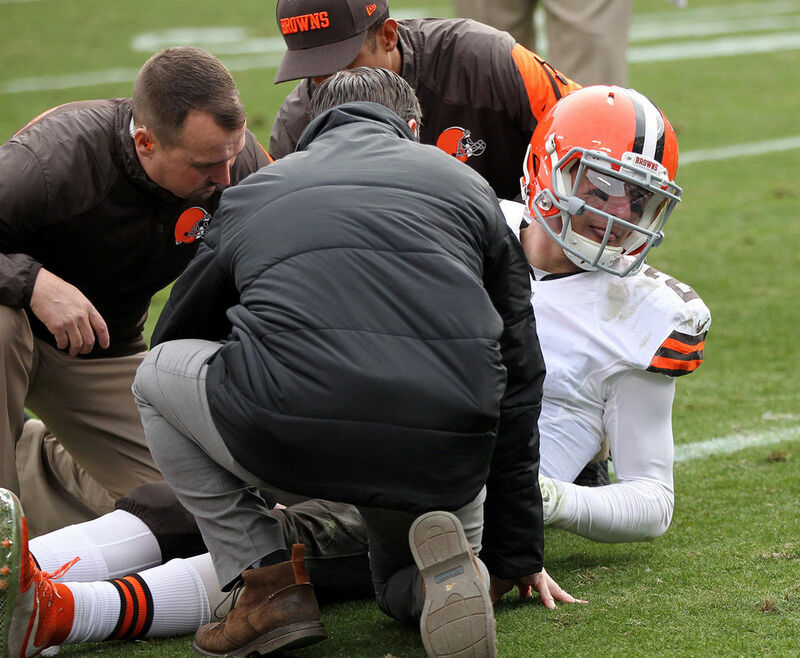 The big news of the day, however, will be the hamstring injury suffered by Johnny Manziel near the end of the first half. That injury will overshadow the fact that in almost a half of play, Manziel once again showed that he is not ready to be an NFL quarterback. Not counting the one-play drive where he was hurt, Manziel led three offensive drives on Sunday against the Panthers, managing just two first downs and three points. In his almost six quarters of play as the starting quarterback, Manziel put up three points out of 13 offensive drives. With Manziel out Brian Hoyer returned to the huddle and, for a brief moment, it looked like the early season magic was back when Hoyer hit Jordan Cameron on an 81-yard touchdown pass to give the Browns a 13-10 lead. But the defense allowed the Panthers to come back and score the go-ahead touchdown (and gave up more than 200 rushing yards for the second consecutive week) and Hoyer, despite getting the ball back with seven minutes left in the game, couldn’t get anything done. After moving to the Carolina 47-yard line, Crowell ran for negative four yards, Hoyer was sacked for negative seven yards, and Hoyer hit Josh Gordon for eight yards on third and 21. The Browns then punted and never got the ball back. While Hoyer was marginally better than Manziel, he still threw an interception and took three sacks and, just like the running back situation, the Browns now must face the reality that they may not have a starring quarterback on the roster. For the second week in a row the offense only had the ball for less than 22 minutes (which may help explain why the defense wilted at the end), and over their past four games the offense has scored three touchdowns in 50 offensive series. That’s a level of ineptitude we haven’t seen in these parts since the dark days of Brian Daboll as offensive coordinator. With one game remaining on the schedule there’s not much left that the Browns can do. If Manziel is not 100 percent, there is probably little value in starting him in Baltimore – even if he is 100 percent they may be little value to starting him. The best thing may be to just sit him for the final game and then hope that an entire off-season of work, a full training camp and preseason will be enough to prepare him to be a starting NFL quarterback – or at least make him look like a quarterback that belongs on the field, which he doesn’t look like right now. As for Hoyer, it probably doesn’t matter so why not let him end the season the way he began it, as the starting quarterback? The Browns have bigger issues to deal with than just next week’s season-ending game, and after 60 more minutes of football they can get to work on fixing them. Maybe, in a promising season that has turned, the fact that it finally comes to a close after next week may be the best news of the day.